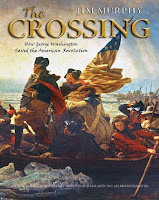 The Crossing: How George Washington Saved the American Revolution by Jim Murphy. Grades 5-9. Scholastic, December 2010. 96 pages. Reviewed from library copy. In the winter of 1776, George Washington, commander of the American army, faced not only the British troops but the panic and disillusionment of the American soldiers. With his ragtag army untrained and outnumbered and half of his soldiers' enlistments ending in the coming January, Washington knew he had one last chance to save his job and his country. So, the day after Christmas... in the middle of the night... in the middle of a storm... Washington crossed the Delaware. You know what you're getting with Jim Murphy - impeccably researched, detailed nonfiction for kids. The Crossing is no exception. Mr. Murphy does a very nice job painting a picture of George Washington and the obstacles he faced when he took command. Washington had never commanded an army of that size and he was met with untrained soldiers whose ideas of democratic freedom led them to desert on a whim. Add to that the fact that the Americans were grossly outnumbered. Washington needed a win. And a win he got. Using maps to show the progress of the battles and positions of the troops, Jim Murphy explains what happened in various battles, including the Battle of Trenton (the first time Washington crossed the Delaware). Mr. Murphy also explains why this battle was a turning point for Washington and for the American soldiers. Mr. Murphy includes lots of archival paintings and portraits to bring the time period and the players to life. The back matter is excellent, including a timeline of the Revolutionary War, a list of sources, further resources, and a detailed index. Mr. Murphy also includes a note about the famous painting Washington Crossing the Delaware, noting its technical factual inaccuracies in light of the bigger message that artist Emmanuel Gottlieb Leutze meant to send. This will be a definite hit for young history buffs and will certainly add to any unit on the Revolutionary War. Kids doing biography reports on George Washington should peruse this book to ascertain exactly why Washington was so important to the Revolution. They'll certainly come across impressed. The Crossing is on shelves now! Hey, it's Nonfiction Monday!! Head on over to Bookmuse for today's roundup!